Abstract: Acetylcholine is an important neurotransmitter whose effects are mediated by two classes of receptors. The nicotinic acetylcholine receptors are ion channels, whereas the muscarinic receptors belong to the large family of G protein coupled seven transmembrane helix receptors. Beyond its function in neuronal systems, it has become evident that acetylcholine also plays an important role in non-neuronal cells such as epithelial and immune cells. Furthermore, many cell types in the periphery are capable of synthesizing acetylcholine and express at least some of the receptors. 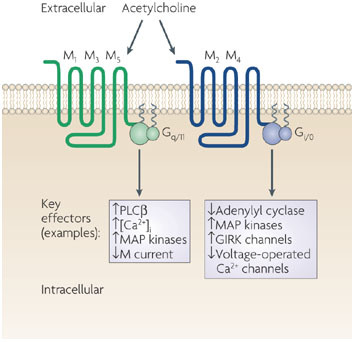 In this review, we summarize the non-neuronal functions of the muscarinic acetylcholine receptors, especially those of the M2 muscarinic receptor in epithelial cells. We will review the mechanisms of signaling by the M2 receptor but also the cellular trafficking and ARF6 mediated endocytosis of this receptor, which play an important role in the regulation of signaling events. In addition, we provide an overview of the M2 receptor in human pathological conditions such as autoimmune diseases and cancer. The receptor has a pentameric structure and a molecular mass of approximately 280 kDa. In muscle, the receptor is formed by 4 different subunits: the subunit α is expressed in two copies; the other three, β, γ and δ, are present as single copies. Nicotinic receptors in brain, as in the neuromuscular junction, are formed by multisubunit structures, their compositions can differ subtly from brain region to region.The nAChRs in brain have a pentameric structure, they can be homomeric (formed by five α7 subunits) or heteromeric (constituted by two α subunits and three β subunits). The α subunits in brain are similar in sequence to the muscle α1 subunit and contribute to the ligand-binding interface: the sites for ligand binding are localized toward the external perimeter of each of the α subunits; occupation of both sites is necessary for receptor activation. The β subunits fulfill the role of β1, γ and δ subunits in the muscle receptor. Actually, in the CNS, at least eight different sequences of α subunits and three different sequences of β subunits of the nicotinic receptor have been identified. The α3 subunit is prevalent in peripheral ganglia, usually with β2, β4, and α5 subunits, while the α4β2 subunit combination predominates in the CNS. The α6 subunit appears to localize with biogenic amine-containing neurons, while α9 is found in vestibular sensory and cochlear hair cells. Receptors containing the α9 subunit may have some muscarinic receptor characteristics. Structural studies show the subunits to be arranged around a central cavity, with the largest portion of the protein exposed toward the extracellular surface. The central cavity is believed to lead to the ion channel, which in the resting state is impermeable to ions; upon activation, however, it opens to a diameter of 6.5 Å. The open channel is selective for cations, in particular Na+. Selective permeation of Ca2+ by some nicotinic receptor subtype combinations, however, fits with a role for these often presynaptic receptors in modulating neurotransmitter release, a Ca2+-dependent process. Nicotinic receptors on neurons, such as those originating in the CNS or neural crest, show ligand specificities distinct from the nicotinic receptor in the neuromuscular junction. One of the most remarkable differences is the resistance of most nicotinic neuronal receptors containing α2 through α6 subunits to α-bungarotoxin and related snake α-toxins. Receptors containing α7 subunits have a high Ca2+ permeability, and Ca2+ entry may be integral to their function in vivo, in particular this selective permeation of Ca2+ fits with a role for these often presynaptic receptors in modulating neurotransmitter release, a Ca2+-dependent process. The modulation of calcium homeostasis and the release of acetylcholine are two important mechanisms known to be involved in cognition and memory: the α7nAChR may play a role in these functions.